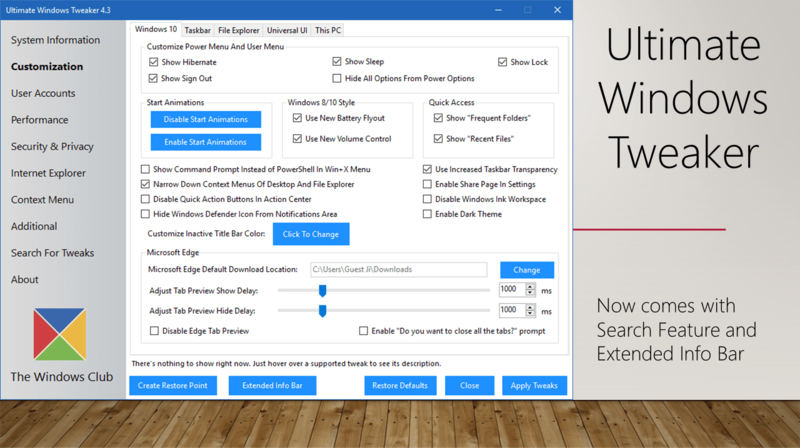 Ultimate Windows Tweaker is probably the most popular Tweaker available for Windows and has existed since Windows Vista and updated regularly to support the latest version of Windows. It has once again updated and version 4.3 is now released. The new version comes with the ability to search tweaks because it was tough to find the desired tweak from 200+ tweaks. But this problem has finally come to an end. Another new feature is Extended Info Bar which shows the description of a tweak easily. This makes it easier to know what the tweak does. Just hover over a tweak and its description will be shown. Not only this but overall 18 new features and tweaks have been added along with improvements and bug fixes. 1. Introducing the search functionality to easily locate your desired tweak. 2. View detailed information about Windows Experience Index including all scores. So, if you’re using an older version, there’s no reason to not to update. You can download it by going to the homepage. Feedbacks are appreciated. So don’t forget to leave a comment below!